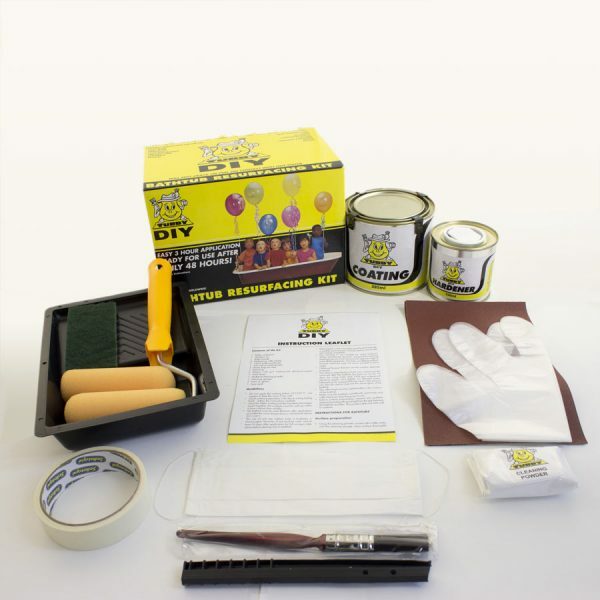 The Tubby Standard Kit is the market leading acrylic bath repair kit. Acrylic baths are the most common types of baths, mainly because they are the most cost-effective. Made of fibre glass, acrylic baths are cheaper to buy and maintain and easier to install. However, the cost saving might come with a compromise. Acrylic bath are also the least durable. This means you will be facing the challenge of replacing them sooner than you might want to. The Tubby Standard Bath Resurfacing Kit has been designed to specifically address two of the most common wear and tear issues that may arise if you have an acrylic bath-tub installed. With our acrylic bath repair kit, you can rejuvenate your old acrylic bath and have it looking like new, avoiding the cost and inconvenience of a replacement bath. With Tubby, the whole process is completely mess free and easy to follow. The Tubby Standard kit comes complete with all the equipment and products you need to Do It Yourself. You get the rollers, abrasive papers, cleaning powder, hardener, final coat, and everything else that eliminates the need to hire a professional. So while you will be saving a great deal on replacement, you will also save the service charges you would otherwise pay a professional. You don’t have a white bath? We know that acrylic baths come in all shades and colours and that is why our acrylic bath repair kit comes in a huge spectrum of colours that can be mixed to create the one you need. Don’t have an acrylic bath? See what we have for enamel bath repair and resurfacing.